Rachel Kim raised $100,000 on Upstart -- and will pay investors 6% of her earnings for 10 years. Rachel Honeth Kim dreamed of starting her own business. But since graduating from Harvard Business School in 2011, one thing held her back: $60,000 in student loans. So Kim sold herself to investors. Literally. Kim sold equity in her personal career using a site called Upstart.com. She uploaded a profile with her transcripts, GMAT and SAT scores, pay stubs, resume and a photo. 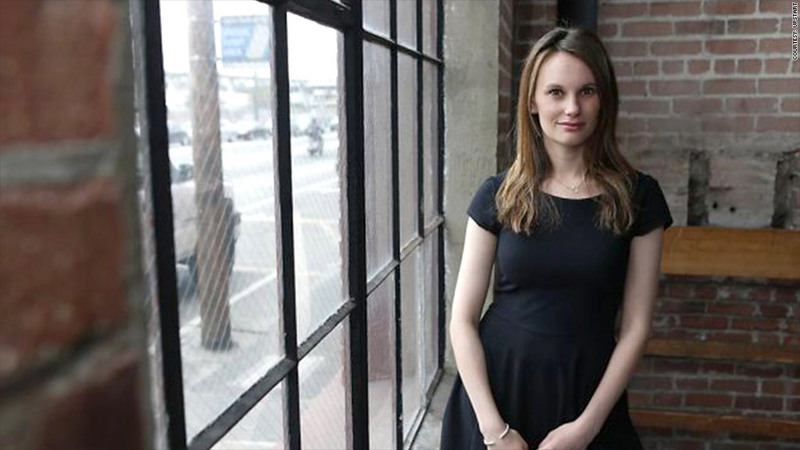 Then she requested $100,000 from investors to pay off her loans and cover startup costs. In return, she offered a cut of her pretax income for 10 years. Call it a new form of credit, a new equity class, or even a twist on indentured servitude. Either way, young people with debt and dreams are turning to unconventional fundraising sites like Upstart, Lumni and Pave that let them offer a piece of their future earnings in exchange for a lump sum of cash. They're using the money to pay off loans, start companies -- even train to be professional athletes. Kim spent hours poring over spreadsheets to determine the financial payoff after she learned about Upstart from a friend. She ultimately decided it was worth it. Within a month of posting her profile in May, she raised $100,000. In June, she quit her job as a marketing manager at a San Francisco startup and started Nailed Kit, which sells art decals for nails. "This is the first time in my career where I am excited to go to work every day," she says. In January, 36 investors began divvying up 6% of her wages each month. That kind of freedom is Upstart's intention, says company founder Dave Girouard. The former Google executive started the company in 2012 after seeing young people held back by debt. Girouard created an algorithm much like the one Google (GOOG) used to predict a new hire's success and used it to predict a person's income over the next 10 years in any job at any company. Upstart verifies an applicant's identity, academic credentials and credit status. Its algorithm takes into account a person's academic and professional background, field of study and previous income -- as well as factors like inflation. The software then determines how much money each person can raise. Approved "backers," or accredited investors, tend to be executives, professors and angel investors. A big part of the program is mentorship, since investors can choose to offer a young person advice, guidance and connections. The "upstart" can offer between 1% and 7% of their income and gets final say on investors. The company has nabbed $7.5 million from A-list investors including Google chairman Eric Schmidt, Mark Cuban, Peter Thiel and venture firm Kleiner Perkins. And word of mouth has spread fast: 14,000 people have applied. Just 150 of them have raised a combined $3 million from investors. The idea of human capital contracts isn't new. In the 1970s, Yale attempted to replace traditional student loans by taking a cut of a student's future earnings. But when people who earned more money complained that they contributed more than their lower-paid peers, the program fell apart. Only recently has the concept begun to reemerge. Still, the idea of placing an economic value on someone's life doesn't sit well with everyone, including Will Herman, a Boston angel investor. He considers startups a safer investment because they involve a group of people rather than a single individual, whose life could take big turns in a decade. "I can't escape this feeling that there is this indentured servitude thing here," he says. "You're really buying into somebody's salary stream, and I don't want my hooks into a person like that." Girouard counters that people who raise money on Upstart can work wherever they want -- they can even take a year off -- and they don't pay returns if they don't earn a threshold amount determined by Upstart's software. The company keeps 3% of an upstart's money and charges backers a fee each year. The concept made sense to Boulder venture capitalist Brad Feld, one of 318 backers on the site. Feld put $6,400 behind six young people. "I view this as a very safe investment with a nice return," Feld says. "The upside is all about helping others." Indeed, Kim has received far more than just cash from her investment. She has gleaned advice on business strategy and received key introductions to people in the beauty industry. Just knowing that a group of powerful people bet on her career gives her confidence and motivation. "There are so many people who believe in me that I don't want to let them down," Kim says. "If I knock it out of the park, I'm happy to give away a piece of the pie. I would never have taken the risk otherwise."